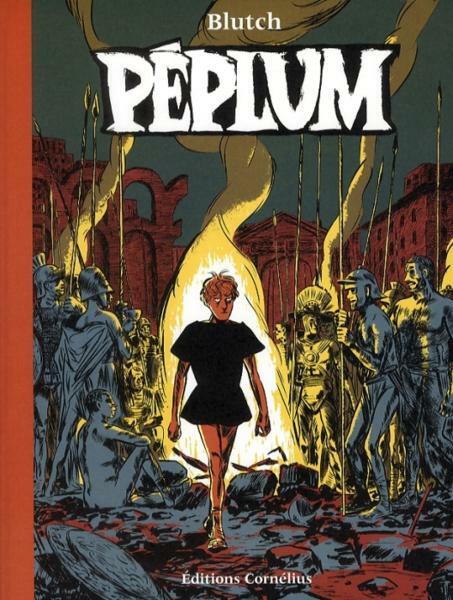 This month sees the release of Pompeii, Frank Santoro’s historical graphic novel, published by PictureBox. I first noticed Santoro as a columnist at the innovative but now-defunct Comics Comics website. We initially began a correspondence based on his perceptive comments about color in comics, a crucial but probably least understood aspect of the medium. When I finally read PictureBox’s hardcover reissue of Santoro’s early tabloid masterpiece Storeyville, I was totally blown away by his gentle, poetic evocation of turn-of-the-century vagabond life in the shifting early industrial landscape of America. Since that time, the Pittsburgh-based artist has become one of comics most important explorers of the potentials of color, mark-making, and thoughtful, emotive storytelling. Santoro’s taste was validated when he served as a judge for the 2013 Eisner awards and his continuing explorations of the mechanics of the medium in his regular columns for The Comics Journal often touch on the issues of color and composition that he imparts to the students of his online correspondence course. But his comics are where his talents find their highest outlet and Pompeii—the story of two artists dealing with esthetic and romantic entanglements on the eve of the eruption of Vesuvius—is their most sophisticated and moving expression yet. James: Your first major work was the tabloid comic Storeyville, which gave a lot of weight to the landscape. The landscape then took the starring role in Blast Furnace Funnies, your exquisite tabloid publication done for the Pittsburgh Biennial. In that story, you equated the transitional landscape of your hometown of Pittsburgh directly to that of Pompeii. Did this lead you to the current book? Santoro: I started Pompeii and then was asked to do a tabloid comic for the Pittsburgh Biennial at the Carnegie Museum. So the two projects were swimming around in my consciousness at the same time. My interest in Pompeii is largely because that area in Italy is near where my father’s father’s family is from. It’s the closest thing I have to a cultural identity. Pittsburgh reminds me of Pompeii because it is like a classical ruin. There’s lots of “classical” architecture here and that paired with the industrial landscape is interesting to me. James: The very effective use of a limited palette of color on your Storeyville was a collaboration with Katie Glicksberg. Can you explain that process? Santoro: I drew Storeyville in black and white with gray tones and made a xerox of [each] page. Then I would color that page with color pencils and Katie would make color separations based on my color guides. James: The work in Pompeii does look like the drawings in an old masters book. You can see in some page’s erasures, bits of drawings hidden behind the panels where you reworked it, variation of thickness of line and shading throughout. Santoro: I wanted the drawings in the book to reflect how drawing changes and how depicting faces and gestures changes. I’m not interested in the typical cookie cutter cartoonist reduction. Or having cookie cutter color. I want the book to be organic, almost like a sketchbook or a diary. The different types of pencils or different types of tones that I employ were chosen to cultivate a particular feeling and that feeling might change from scene to scene. James: Pompeii also displays a looseness of visible process; some drawings show hesitation or erasures, and this to me adds to a sense of intimacy between you and the viewer. Santoro: The book itself is about drawing, really. It’s also about two artists who draw in order to see the world around them. So, the book itself IS drawing—and at the end it breaks down the barrier between what’s “real” and what is “drawn”. That’s what is great about the medium—that I can use drawing to illustrate that breakdown. There are a lot of visual rhymes in the book—where the “reality” is mirrored by a painting or a drawing. I’m trying to get to the core of visual storytelling by amplifying the process of drawing and making that the subject of the story as much as the interaction of the characters. James: Along with associations to 9/11 and the various hurricanes, tsunamis and earthquakes that are always happening in the world, Pompeii relates to the general sense of impending environmental catastrophe that we all feel (apart from those in denial). How much did you intend your story from the first to resonate with our current situation—because it does and so strongly. Santoro: I was living in New York City when the towers fell. So, I tried to pull from that memory and the time around then. I have many friends who drew the towers that day while it was all happening. It was a way of making sense of it, I guess. And I guess that I’m simply trying to make sense of my own feelings of unease with the current sense of catastrophe that you mentioned. It’s heavy stuff that comics can take on well I think because so much of it is easier to express with images and the combination of text and image than just words alone. Vesuvius is a great symbol for sudden death and a sort of rebirth through art. It was a way for me to tell my story and hopefully connect it to history and something larger. James: This is a book that could be shelved in bookstores in the historical areas, in the same way that Art Spiegelman’s Maus, Jacques Tardi’s World War I books and Joe Sacco’s comics journalism efforts can be. Have you discussed these potentials with your publisher? Santoro: I think Pompeii could be shelved in sections other than the graphic novel section. I think that people who don’t read comics but who may be interested in Pompeii [the historical event] might read it. I made this comic for women really, for women who don’t read comics specifically. Those involved with comics always wonder why they are still in the gutter in the U.S. and one of the reasons simply is that the majority of the material is unappealing to women. Period. I wanted to do a story about men and women and set it against this epic backdrop. I think that’s something we can all relate to—love and loss. My publisher, Dan Nadel, told me that the book sold well at comics conventions, fine art fairs and literary book festivals—so there’s some gratification for me in that market research. Comics are definitely growing beyond their familiar borders. James: Can you explain the thinking behind Pompeii’s release in trade paperback format rather than a perhaps more durable hardcover binding? Santoro: A book’s format is a very important consideration for me. I chose to use the soft cover with heavy cardstock covers to give a feel of something rough. I’m thinking of the walls of Pompeii and the grit. Plus the “rough” quality of the drawing. I wanted the format to mirror that feeling. I want it to feel like Pompeii and feel like old drawings. I wanted the book to be softcover also because I’m going for something in between a Japanese, French and North American format. I like the way manga reads fast in a softcover format. And I like the way certain French albums that are perfect bound with heavy cardstock covers can lay flat on the table, like Blutch’s Peplum from Editions Cornelius. I also wanted to do something different than the comic books or graphic novels that are visible here in the States. There’s really no North American book with the format of Pompeii out there. So, I think that helps it stand out on a shelf. PictureBox and I had many discussions about the format and the price point. Overseas printing is a reality for everyone in publishing, I think. There are more options, really. However, having a hardcover was never really an option or even a thought for me. Or full color. I chose to print only in one color. I sent samples of bindings that I liked to the printer and they sent back some print dummies. We did a lot of proofs. I wanted to make sure the color of the ink was just right. There was an incredible amount of thought that went into the format, which was as careful of a process as making the story itself. Format fever is what I like to call it. I think everyone who loves making books can relate. James: You are one of the few alternative/literary cartoonists who is willing to collaborate with other artists, it seems—you did Cold Heat with Ben Jones and worked on several short stories and some animation with Dash Shaw. In the alt/lit zone, the focus has been on the solo auteur—in good part for good reason—as a reaction against the exploitations of the mainstream. But, it is my feeling that small collaborative units can accomplish things that individuals maybe cannot and I wonder, how many people are excluded from the higher levels of achievement by the insistence on being able to both write and draw on a high level? Santoro: That is an interesting question. I think it is unfortunate that many artists who are not great writers struggle within alternative comics. And vice versa. I appreciate the assembly line approach of mainstream comics and do wish that there was more collaboration within the alt scene. I think that the older guard like Clowes and Burns had to get so far away from the way things were/are in mainstream comics that there was/is a slight stigma to doing collaboration. That attitude is changing and I think there are more “bullpen” type collaborations. I can definitely say that my collaborations with Ben Jones and Dash Shaw and many others have made me a better artist and a better writer. James: You have a correspondence class, which focuses on the art aspects of comics.. How do you go about imparting information about developing content or stories? Do you advocate any sort of approach to process where both art and text develop in unison, for instance? Santoro: I’m specifically teaching sequencing. I don’t teach the history of the form. I focus my students on simple sequencing, like they were making a storyboard for an animation. Comics is all about timing. So I “fix” the format and use the eight-panel grid. That means each panel is basically the size of a 3 x 5 inch index card. The student can then edit without rearranging the whole page and spread. It’s very simple. I am trying to subtly influence comics culture. There are so many young people trying to make comics, however I think many of them become discouraged because they don’t know how to plug in and learn sequencing and timing. I held a contest this summer where it was required that those participating use the grid. The response was overwhelming. People who never made comics before wrote to me and told me that this method changed their lives. It was very gratifying. James: Whenever I have been in front of art students, the main thing I tried to impart is that the best thing about comics is that it is a medium that can be free of rules. And, those involved in the alt/lit areas of comics often work other jobs to support their comics careers—how helpful is it for young people to train for a business that, honestly, often isn’t about making any sort of income? Santoro: I provide a platform for my students with my Comics Workbook tumblr and magazine. Students go through my program and then, if they are willing, I funnel them into Comics Workbook. I promote them and help provide a space for them to acclimate to the “scene” and the realities of the market. The rules that you speak of are changing. What is fascinating to me is that now there are prose authors and visual artists who want to learn comics sequencing. They think it is easy but it is very difficult. The skill set is changing. Comics are ascendant in the culture now like never before—so I don’t really see the ceiling anymore. It’s not just about jobs at mainstream companies or newspapers. The models now are people like Kate Beaton or Lisa Hanawalt. They are exciting artists because they are cartoonists—and they are making the new rules. They are free of rules, however they needed rules in order to learn their art. It’s like music. You gotta learn your scales first and then you can play free jazz.